Takata Race Series Harness UNIVERSAL - Lightning Motorsports - Selling Speed since 1996 ! Takata RACE belts are manufactured by Takata Racing in Germany to the latest FIA standards. These 6 point belts feature 2” lap belts, and either 3” shoulder belts, or 3” to 2” HANS® specific shoulder belts. The sub-strap uses Takata’s compact T-Bar sub-strap. Both snap-on and bolt-on options are offered for mounting. Versions of the RACE 6 belts with 3” lap belts are also available with SFI certification. 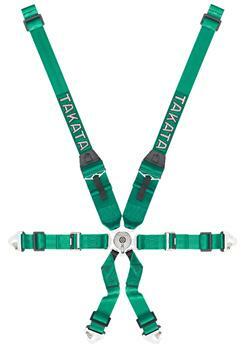 Takata also offers 4 point RACE Series harnesses. Unique to these products is the feature of ASM® (anti submarining mechanism) which is added to the right shoulder belt. ASM® activates whenever an impact of a critical level occurs releasing and extra two inches of webbing on the right shoulder – allowing enough upper torso rotation and thus helping to reduce the likelihood of submarining. In additional unique bendable stainless steel mount bracket for the lap belts allow for easy installation to factory seat belt mounting points.